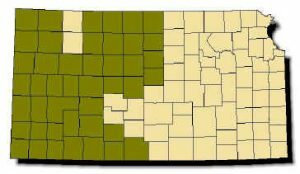 Range: Found throughout the western half of Kansas from Jewell County in the north to Barber County in the south. 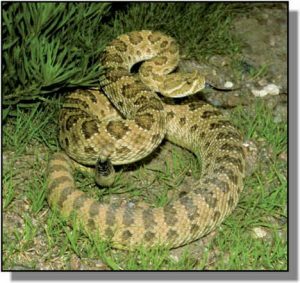 Description: Pit on each side of head between and slightly below the eye and nostril; large rattle on tail; small scales covering most of top of head with one large scale over each eye; pattern of 30–55 dark gray or brown blotches on the back; dark bands on the tail. Head, body and tail are greenish gray to brown; tail bands similar in color to body blotches. Belly grayish or white. Young look like miniature adults. Habits: Prefers rocky canyons and open prairies with an abundance of small mammal burrows. Suns on south-facing hillsides with large rocks in spring and fall; roams open prairies in summer, when it is often nocturnal. Females produce litters every other year; 5-18 young per litter, born in spring, summer or fall. Eats lizards, rats, mice, gophers and young prairie dogs.